The iconography and architecture of the Chartres Cathedral can be looked upon in many ways. However for one with “eyes that see” much can be understood by looking at the work the Craftsmen who built the Chartres Cathedral produced over time. The major part of those mysteries have been encoded and represented through the use of Christian iconography. 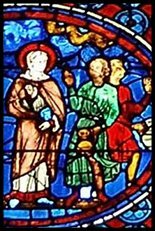 But when looked upon with the proper information, one can understand how those images go back way before the Christian era. An exhaustive explanation of all the wonders that can be found in this Cathedral goes far beyond the scope of this website. However, we have devoted this section to expand on some historical information and esoteric treasures depicted in key places of the Cathedral. 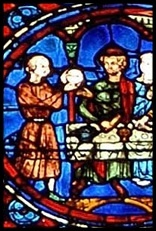 Wedding at Cana (Blue Virgin Glass). 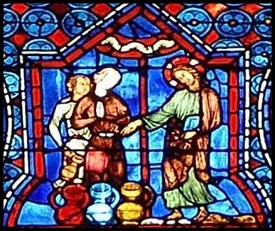 Jesus holds a Blue book and reaches over three coloured jars.